Hi Amy, thanks for sending me a friendship request. Of course yes, I gladly accept. I shamefully still haven’t given my Journal to anyone yet. I have been busy but of course that is no excuse. I plan to get to it this week. So when I do I will keep everyone posted. Take Care Amy and I will chat with you later. 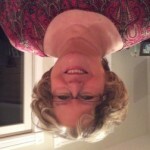 Thanks so much for fixing my upside down profile pic. I really appreciated it. Sorry for the upside down version of me here..LOL. There was no option to rotate my photo. Any suggestions to help me out here. Thanks.